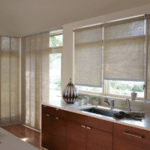 As Westchester County New York’s top Hunter Douglas Gallery professionals, we carry a wide range of top window fashions. 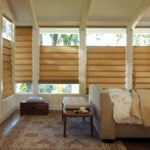 We have a full lineup of Hunter Douglas window products to choose from, including shadings, sheers, louvers, panels,blinds, and more. As a premier name in the window fashion industry, you can always count on Hunter Douglas products to provide easy maintenance, top quality durability, and top of the line energy efficiency. Hunter Douglas’ elegant Alustra® Silhouette® window shadings combine the softness, beauty and light diffusion of sheers with functional fabric vanes for total light control and privacy. The vanes are suspended between two sheer fabric facings and offer a wide selection of beautiful fabrics and optional features that, when fully raised, completely disappear into the headrail. Beautifully designed front and back without gathers, cords, or grommets, Alustra® Vignette® Modern Roman Shades combine the elegance of a soft drapery with the function of a shade. Exclusive features include a dramatic 6” fabric fold size and a fabric-covered headrail and bottom rail for a completely finished look. Weave an exquisite warmth into rooms with naturally inspired Hunter Douglas’ Alustra® Woven Textures™, a light-filtering alternative to solar screens that personifies casual elegance. Available in an equally versatile choice of operating systems. Select the clean, simple look of window shades or choose the added dimension of Roman shades.